I am your typical teenager that can tend to spend hours on end using social media such as Snapchat and Instagram. It’s where all the teens hang out these days, and I like keeping up with all of my friends and acquaintances on these sites. For this reason, books centring around social media have a soft spot in my heart. I almost always end up devouring all books of the sort, and now I most especially adored How to Disappear. It was so touchingly real and I adored every millisecond of my time reading it. For a quick summary, this novel follows high schooler Vicky Decker. She is a tad socially awkward, so when her best friend moves away, she is left with no one to count on. To make herself feel happier, she decides to create an Instagram account entitled @Vicurious on which she photoshops her head into others’ images, making them look as real as possible. As her account goes viral, she finds out that she is not the only one who feels the way she feels- hundreds upon thousands of others feel the same way. It was obvious that Vicky was having some trouble feeling comfortable in her own shoes, but nonetheless, she was an amazing and inspiring character that all readers can look up to with ease. She was very intuitive and understood people’s feelings, which is often what I look for in an awesome protagonist. Although photoshopping your head onto others’ pictures isn’t necessarily the most ethical thing to do in the type of situation that Vicky was in, she made it seem so real- and this was what made her followers fall in love with @Vicurious. I must say that the super intriguing premise is what got me hooked in the first place. As I said earlier, books about social media always perk me up, and this one was a no-brainer. Contrary to many other contemporaries I’ve been reading lately, this one, in no way, shape, or form, left me confused or bored. Instead, every second excited me and left me wanting more and more. I never wanted it to come to an end! 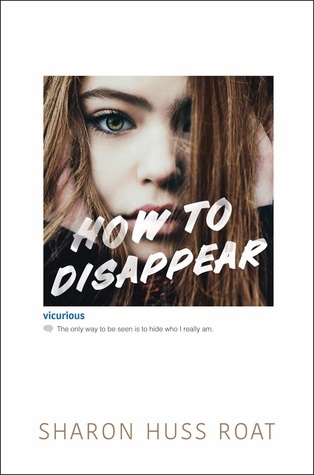 To recap, How to Disappear was a raw, authentic novel that teaches us that no one is ever alone, and it as well proves that social media can in fact be helpful over harmful sometimes, with the latter being more emphasized in many books. If you are a regular social media user who experiences “FOMO” and other struggles regarding social life in high school, then this book is for you. It was so moving and inspiring that I think I may just have to grant it 5 stars! I haven’t read this one. The premise kinda sounds like it would be a sad read. Looks like you enjoyed it through 🙂 Great review!